Hi friends! I hope you're having a great day! Brady has a cough today so we are gonna take it easy. I hope he's not sick but I think he is. Just a cold though, so don't worry! 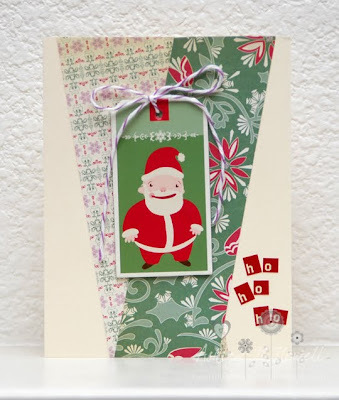 Today I'm sharing a couple holiday themed cards that I made for some WCMD challenges. First up, here's another one for Lea's Halloween Challenge. 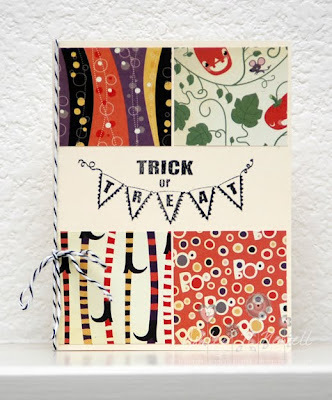 For this card I used a Recollections stamp with some Cosmo Cricket Mathilda papers. I added some Black Licorice Divine Twine to this as well. Here's a card I made for Stephanie's Christmas Card Challenge over at PWCO. For this card I just used some Cosmo Cricket Mitten Weather papers and chipboard. Then I added some Cosmo Tiny Type letters and some Purple Plum Divine Twine. These are so cute, Ashley! I love those darling Halloween papers you used! Thanks for playing in my challenge again!! Love the papers you chose for both! Thanks for playing with us at PWCO, girlie! !